We are now offering a Spring Break Paddling Camp option, similar to our CanoeKids Summer Camp Program! If you also register for our Spring/Summer Racing program, then the Spring Break camp cost is only $100+gst! Either use an existing account if you have one, or choose to register new participants. Indicate the number of participants you would like to register. Fill out the participant(s) details. Review the cart, and proceed to checkout. Upon payment, please save the confirmation for your records. That’s it! Can’t wait to see you at the camp! We will be sending more details out to participants closer to the start date. Please contact flatwater@fcrcc.com if you require any assistance with your registration. 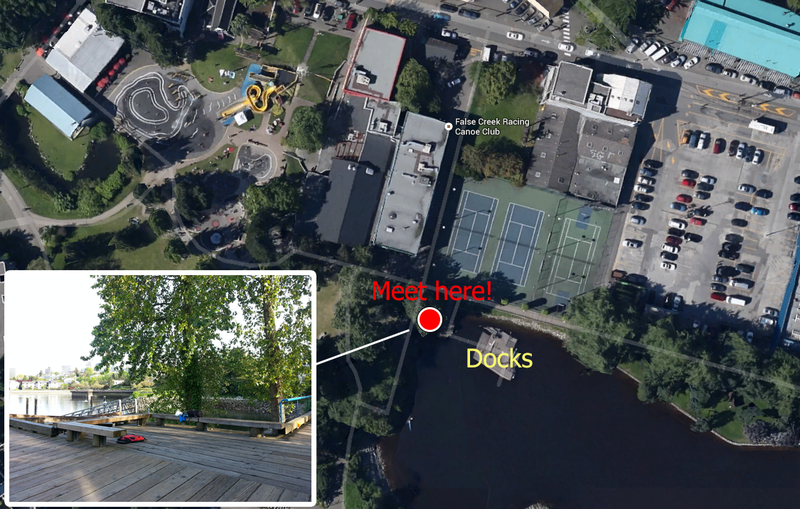 We are located just behind the False Creek Community Center (please see attached map of the area). At the start of every day, please sign in your kid(s) with the instructor in charge of attendance right by the wooden benches. In case you are running late, the kids will likely be starting off the day with a land game/activity on the grass area near the benches. Please find us there and sign in with one of the instructors. At the end of each camp day, when you pick up your kids, please make sure you have signed them out with the instructor in charge of sign outs. We just want to make sure all the kids are accounted for. We understand that some kids may be getting to and from the camps on their own so please let us know if that is the case so we know. Note: Please let us know if you will be missing any days / need to leave early, etc. so we know. – clothes to paddle in (e.g., wetsuit, athletic wear – shirts/shorts). There is definitely a chance that the kids will get wet so something that is quick drying is recommended as opposed to cotton. – lifejacket (optional) – All kids will be required to wear lifejackets. We have a lot of lifejackets at the club but if you have your own, you are welcome to bring it. Please label it with your kid’s name. – water bottle – there is a water fountain nearby if needed. I recommend labelling the water bottle as well. – 90% refund of the registration fee if cancelling at least 30 days before the camp week to cover admin fees. – less than 14 days, it’s 50%. – less than 7 days would be 0%.